Heeft u een vraag voor Green Cat Ba Hostel? Green Cat Ba Hostel is in 2012 en garandeert gasten een plezierig verblijf in Cat Ba Island, voor zowel zaken als plezier. De accommodatie ligt 91.8 km van het stadscentrum en de belangrijkste voorzieningen zijn dus goed bereikbaar. Niet minder uitzonderlijk is het feit dat veel attracties en monumenten in de buurt liggen, zoals Cat Ba haven, Kanon Haven, Ben Beo haven. Green Cat Ba Hostel biedt gasten superieure services, plus een breed scala aan voorzieningen, en is toegewijd om uw verblijf zo comfortabel mogelijk te maken. De accommodatie heeft een uitgebreid aanbod aan services, inclusief 24-uur roomservice, gratis wi-fi in alle kamers, 24-uur beveiliging, taxi service, ticket service. De ambiance van Green Cat Ba Hostel weerspiegelt zich in de inrichting van iedere gastenkamer. spiegel, handdoeken, internet (draadloos), draadloos internet (gratis), rookvrije kamers zijn slechts enkele van de voorzieningen die u ter beschikking staan. De accommodatie biedt talrijke recreatieve mogelijkheden, zodat u voldoende te doen heeft tijdens uw verblijf . 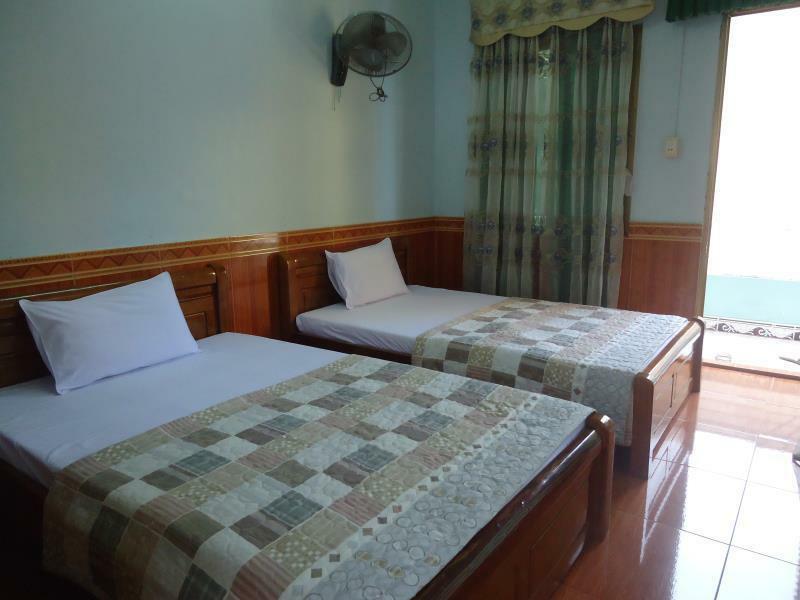 Green Cat Ba Hostel is een ideale verblijfsplaats voor reizigers die charme, comfort en gemak in Cat Ba Island zoeken. We booked and paid one night, however, when we arrived we were told that they were fully booked and it is Agoda's fault not theirs. The very cocky and unfriendly owner said that he has another room but it is more expensive and we have to pay that otherwise we can have the money back, though excluding the Agoda fee, which he said was 20%. So a typical scam! Since unfortunately everything else in our price range was fully booked in town we had to take the other room, which turned out to be the worst night ever - the room had no windows, but mold and was beyond dirty, the AC was not working, the power would occasionally go off and there were rats! We were a group of three females who are backpacking. When we arrived check in was not done but we were given a room start away, which we found strange as they did not take any of our details. Breakfast was served, they provide the typical breakfast menu in Vietnam such as eggs, bread, fruit, coffee etc it was average but filling. The young boy that worked there provided good customer service regardless of his English not being so fluent. When we saw the property owner she stated that the price given by Agoda (who we booked the property through) was not correct and as lovely as she seemed she was unprofessional and kept asking us to pay more or contact agoda ourselves to resolve the issue, despite providing her with our confirmation email which clearly stated three people, 1 room and the total. Initially we found two residential guests helpful as they were friendly and spoke English well. However they seemed to interfere and not help when the price issue arose. We have stayed there for 2 nights. The staff is very friendly and helpful. Always when we have eaten there it was delicious and fresh prepared. Especially the banana pancake is just awesome. The room is big enough but a bit dirty also has a strange smell. For just couple days is it totally fine. It was decent but the hostel was slightly overpriced. If you have your own pillow slip, a sleeping liner, towel and some wipes to give the bathroom a quick clean you will find this stay just fine. 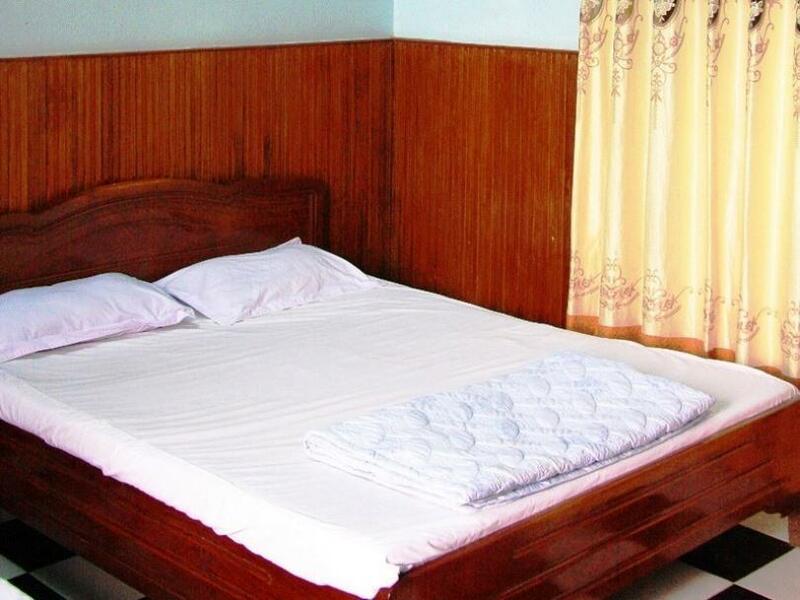 The beds are hard, but relatively standard to South East Asia. For the cost of the rooms, we were not impressed. They were dirty, the toilets often wouldn't flush and we had to get the staff to come and fix the air cons. A huge positive was that the staff were more than willing to help us - to book buses, to fix things in the room etc. A little more cleaning on the owners behalf would go a long way to make this stay better and more worthwhile the room fee they charge. Location is good - not on waterfront but still walking distance to everything. the western food available at the cafe was the best thing. We had a great time in Cat Ba despite our short stay. The hotel was great (simple rooms, clean), breakfast was yummy both mornings (omelet with bread, and a banana pancake) there is a club a few doors down with you could here from our room but the white noise from our fan was enough to cover it. The staff was excellent and extremely kind; they are an absolute reason to return. Friendly staff. Room wasn't cleaned properly when we first arrived, floor was wet and had a lolly wrapper and little crockcroaches around. Foot mat for bathroom was dirty and so were the towels. Was given a twin room rather than a double and one of the bed sheets were clean but still had some stains. I was not impressed with my stay at the Green Cat Ba Hostel. But before I delve into the negative points, let me list the positive qualities: the rooms are very cheap and the location is good. Moreover, the Hostel has a nice restaurant area which is great for playing cards or having a coffee. 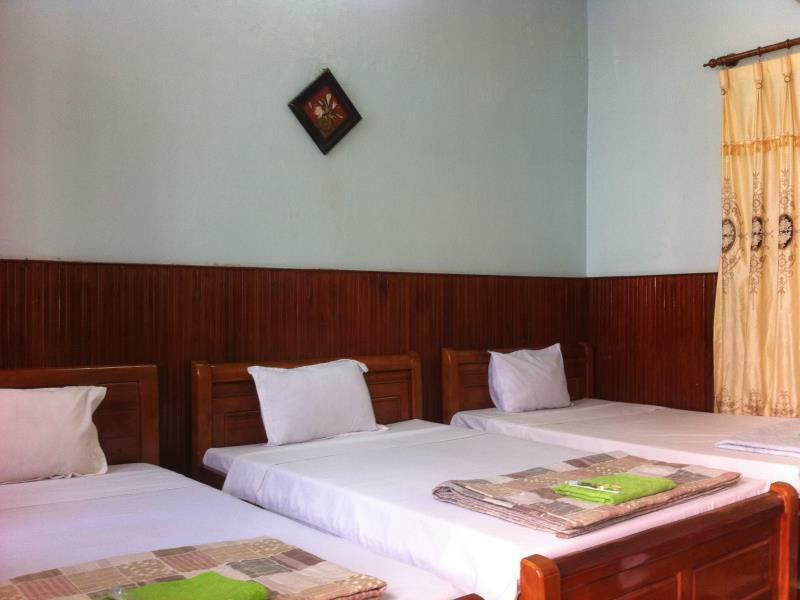 HOWEVER, there were many things that made my experience at the Green Cat Ba Hostel less than pleasant. First of all, it is not very clean at all. 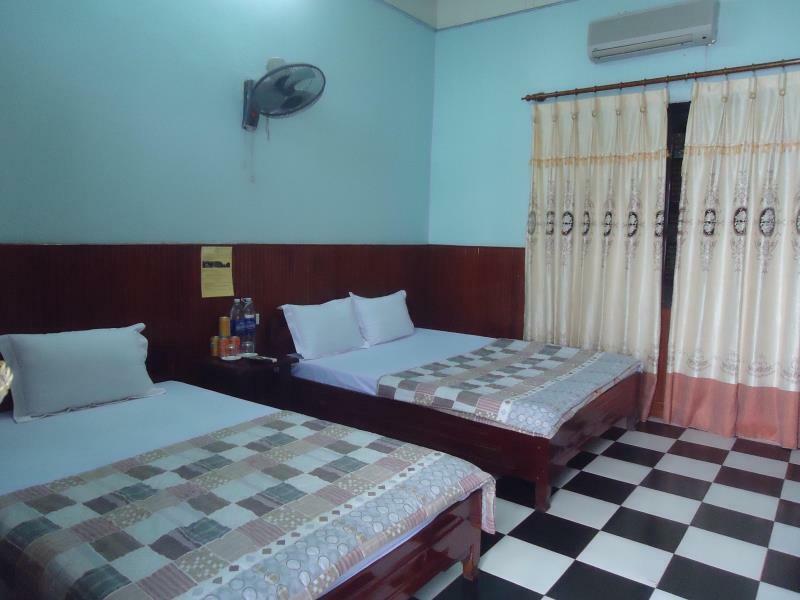 The rooms weren't cleaned even once while we were there (and the price - even by Vietnamese standards - is not low enough to warrant such a basic treatment). The towels had obviously been used before - there was a large lipstick stain on my towel (you could actually see the full lips). The bathroom was okay, but there was no hot water and almost zero water pressure in the shower. They also sold us a kayaking tour which was supposed to include a local guide. Well, the local guide dropped us at the kayaking spot, without a map or any information on possible routes. No one ever enquired about our proficiency as kayakers or swimmers or told us anything about tides etc. Needless to say, the tour was not only horribly pricey, but the kayaking part was also quite dangerous in hindsight. Please, only book tours with a reliable tour operator such as Cat Ba Ventures! All in all, this is an okay place to stay for anyone on a budget. If you can afford a better place - go for it! do not stay here!!!! awful, no shower no hot water, owner lies to sell tours. food is slow and average with served in preference . there is a very noisy nightclub a few doors away. First night of 2 nights, we were re-directed to another hotel (at their expense) Unknown at the time, this was a blessing, or otherwise we would have left after the first night. On the next day return to the hostel we realised its "get what you pay for" The place is really "tired"
The staff were extremely kind and helpful. Quick attentive service. Big room. Nice, quiet place with personality, still quite close by to sea. Room could have been bit more cleaner. When checkin in I asked if everything was ok with my reservation, but when I was leaving (and in a hurry) they suddenly wanted to check my reservation and made a fuss about it. First off, this isn't a hostel - I originally picked it because I thought it was. It's just a hotel, with little bungalow/cottage style rooms. But it matters little because the entire little town of Cat Ba has plenty of other travelers, so it's not hard to meet people. So, the Green Cat Ba HOTEL was nice enough for the price - the sheets were clean, the water pressure fairly decent (not US-standard decent, but SouthEast Asia decent - I had enough water flow to wash my hair! ), and the biggest plus was that it was off the main drag so it was fairly quiet (with the exception of Saturday night - but I think there isn't any place you can go and not hear a club with booming music). My only gripe was that I was in a room next door to where the family that owns the hotel/lives there, and I could hear their comings and goings, and TV and bathroom noises. Also, the bed was hard as a BOARD. Like, hard. But whatever... it was $8 USD/night, and clean enough that I didn't weird out about it. All in all, it got the job done. Trotz Buchung über Agoda war das Hotel überbicht und als Ersatz mussten wir in ein anderes Hotel.